All smiles hiking on Day One at Davis Mountains State Park. As I've done each year since I've moved to Austin , I headed out to West Texas during the holidays once again. Two years ago I visited Big Bend National Park and last year it was Guadalupe Mountains National Park. This year I was a little more ambitious: I visited three state parks, a state historic site, a national park, a city park, a national recreation area, and about a half-dozen small towns. Over the six days I was gone, I walked more than 70 miles and drove nearly 1200 in addition to that. The trip was awesome and it made me want to back into voluntary unemployment so that I could have a lot more time to travel! Throughout the trip, I kept a rough schedule but also took liberties with my time, taking detours to explore places that looked interesting, reading historical markers along the road, and stopping constantly to take photos of the stunning landscape. To plan what places I would visit, I largely used the Texas Department of Parks and Wildlife and The Most Scenic Drives in America, compiled by Reader's Digest. Using those two tools I ended up with the following list of must-sees and then built my trip around them. 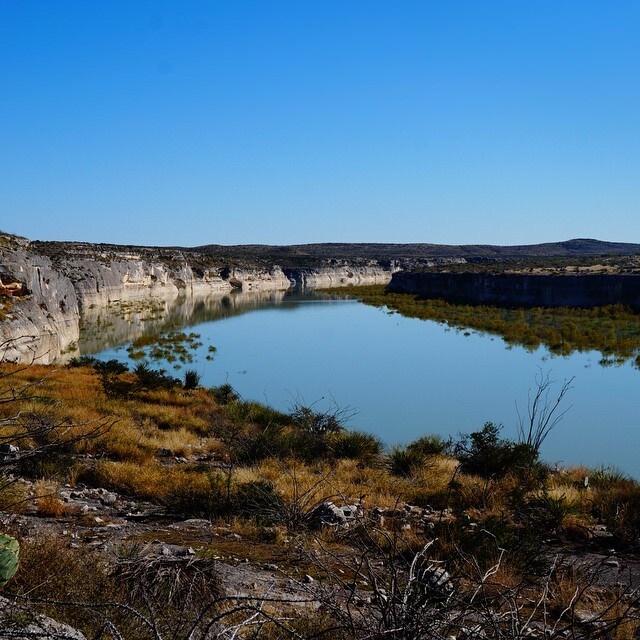 Once I was out on the road, I ended making a few significant stops in parks I hadn't anticipated working into my trip including Fort Leaton State Historic Site, Big Bend National Park, Amistad National Recreation Area, and Kerrville-Schreiner Park. All hiking would be complete by roughly 5pm so that I'd have time to set up camp before dark. I wouldn't force myself to wake up earlier than usual, my usual being roughly 8am. No more than four hours would be spent in the car on any given day, with the exception of getting out to West Texas and back to Austin. I would avoid highway driving as much as possible. I'd try to make sure there was a place for me to shower every couple of days. I outlined the itinerary on my calendar using Sunrise then used Evernote to organize all maps, directions, lodging confirmation numbers, etc. that were relevant to my trip. I calculated total mileage and driving/hiking time using Google Sheets. My final itinerary is outlined below and I'm hopeful that I'll be able to find time to share more details about each day in a subsequent post. Real life tumbleweed in Fort Davis! To check out the best photos from my trip visit my West Texas 2014 album on Google+ or follow me on Instagram. Three years running and there's still so much more I want to see! I'd really like to get to Devil's River State Natural Area, Mt. Livermore (the highest peak in the Davis Mountains), Franklin Mountains State Park, and the Chinati Hot Springs. I would also like to hike new areas of Guadalupe Mountains National Park and Big Bend National Park. If you have any additional recommendations on what to include on my next trip to West Texas, leave them in the comments below. Posted on January 10, 2015 by Krystal Webber and filed under Travel and tagged travel hiking texas road trip.